Nokia today introduced a new touch screen phone that is in direct competition with the iPhone 4. Nokia’s N9 unveiled at a conference in Singapore is running the Meego software that Nokia is phasing out in favor of Windows. However the geek crowd is excited about the specs of this phone rather than the software it runs. It has a 3.9-inch curved AMOLED touchscreen behind Gorilla glass, with a 1 gigahertz A8 processor, 1 gigabyte of RAM and 16 or 64 gigabytes of storage, which as we know is a lot of storage. It has absolutely no physical buttons at all on the face. N9 also has a 8 megapixel Carl Zeiss wide-angle lens that takes 720p video and a second camera for video calls. It also has HSDPA radio is capable of up to 14.4 Mbps downloads. Nokia N9 also has turn-by-turn navigation for walking and driving and a built-in “Drive” app for automotive use. Microsoft plans to use Nokia’s navigation technology as part of their partnership so this might be a standard app on all Windows phones soon. 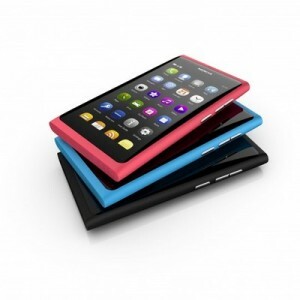 The Nokia N9 also has the NFC capability for wireless credit card transactions. Are you going to get one? No info on pricing yet! Nokia Launches its First Windows Phone! Next No More Unlimited Data Plans from Verizon! So, what carriers will have it?